Today I hit the magic 62 and can officially become a ward of the state. To celebrate went out with the wife for a birthday sail. Wind picked up, wife's hat blew off, tried several times to sail back and pick it up, one of the jibes was a bit too violent, ripped the main sail all the way up, started the engine, went back to the marina, and had a few beers. Great way to spend a birthday! Congratulations on your birthday. Sorry about the damaged sail, can it be repaired? Thanks. No problem with the sail, it was over 20 years old and beginning to dry rot, so I will throw it out. I have a good sail I put on, and when that one goes it will be my time to go as well. I can tell you've been there :-) What do you sail? We have a "pocket cruiser" at home (Sanibel 18), but charter bigger things for vacations (anything from 25 to 45 feet). What a beautiful little pocket cruiser! It's really all one needs for protected waters. I prefer small boats myself, as long as I'm not in the middle of the Atlantic. I also have a Capri 14 that I love to sail, though it's not a pocket cruiser. My experience is that the bigger the boat the less it's used and the price goes exponential with the LOA. Here's a web site you might enjoy. Congrats on becomming a ward of the state. Can you let us know how you receive your first SS check? I've been paying my income taxes and SS taxes and never received anything back. I can wait - I don't want to hurry life but I want some of my money back. I should have wrote "how you feel"
Yes this is the time of year to get them ready. You beat me to it still have to do the spring thing and launch. 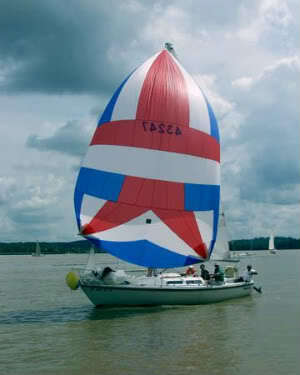 Nice Spinnaker, similar to the one I use for light air, which I designed myself. Looks like Great Minds Think Alike. Nice boat too, is that a Tanzer 25? I learned on a Tanzer 22, sailed well and built like a tank, could take anything. Hope you get her out soon, I see you're further north than me, a bit later start of the season. But then, our season on the Chesapeake takes a pause from mid July to mid August, when the wind dies and the tstorms start popping.